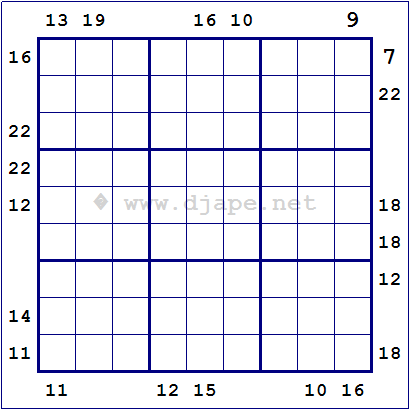 A novelty for this site – Sum Frame Sudoku! 🙂 No, it’s not an Outside Sudoku. 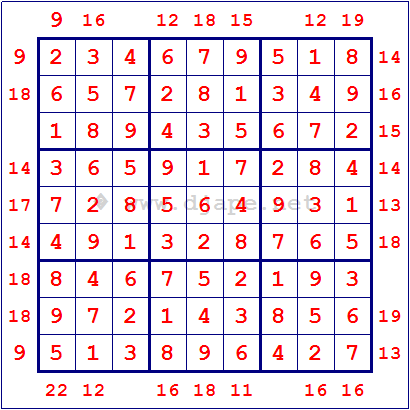 It’s more of a Killer Sudoku Variant: the numbers outside the grid tell you the sum of the 3 numbers closest to it. 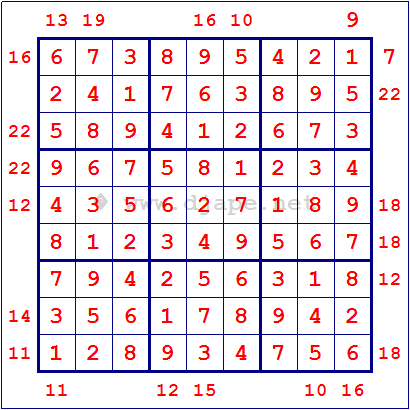 So, yes, in a way it is also similar to Outside Sudoku, but here you do have to process the sums of 3 numbers (always 3! ), hence it is more a killer variant. The rest of the rules are standard Sudoku rules. I guess that’s clear enough for the rules of Frame Sudoku. If not, please ask questions. UPDATE: I decided to present you not one, but two frame sudoku puzzles! First one is EASY, the second one is BRAIN. 🙂 So enjoy! 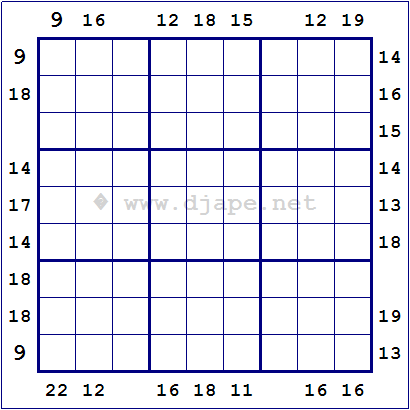 PDF Version of this puzzle: Frame Sudoku Sums PDF EASY. PDF Version of this puzzle: Frame Sudoku Sums PDF BRAIN. This entry was posted in Free sample puzzles, Killer Sudoku, Sudoku Variants and tagged killer, variant. Bookmark the permalink. Post a comment or leave a trackback: Trackback URL. Your sum-frame puzzle looks intriguing, but why start us out with a BRAIN? I need to start with an easy/cool one!